Ever wonder how the makers of baseball cards have shots of players with their new teams all ready before the season has even started (and spring training has barely started)? Well, in the dark ages they used to take head shots of players with their heads tilted up, obscuring the logo on the cap, specifically to simplify the process of airbrushing out the offending team colors and adding the new ones. Now, with the wonders of Photoshop, Cliff Lee can appear on a Topps Opening Day card, in game action, wearing a Seattle Mariners uniform. The black HK patch that the Phillies wore last season to honor the late Harry Kalas is still visible on Lee’s left side, just above the Mariners logo. The untimely passing of Harry Kalas yesterday has left a void in the lives of Phillies fans everywhere. I’d like to say that I’d been listening to him since childhood, as many others have, but that would not be true. Though I was a baseball fan while growing up and through high school and college, I didn’t really pay much attention to the announcers. It wasn’t until I moved to Philadelphia and started to really follow the Phillies that I became enamored of Harry’s wonderful voice. Harry had one of those voices that could make anything sound better. He could probably have read my shopping list aloud and made it sound dramatic and meaningful. 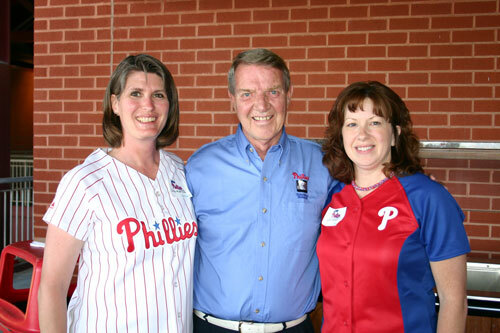 In 2000, the Phillies had a Harry Kalas Tribute Night to honor his (then) 30 seasons with the Phillies. They gave away “Talking Harry”s, a beanbag/slammer type head that said some of his well-known phrases, like “struck him out” or “that ball’s outta here” in the way only Harry could say it. Yesterday, I got mine off the shelf to listen to it again. Ironically, its voice was gone, silenced by dead batteries. Through 30 seasons, you’ve provided the soundtrack to our summers. You call the game with a balance of true professionalism and humor, grace and enthusiasm. With a nod to His Whiteness, we salute you as “The Voice” of Philadelphia and the Phillies. Thank you! I could not say it better myself. For those of you who may not know who His Whiteness was, it is a reference to Richie Ashburn, Harry’s longtime broadcasting partner who had passed away in 1997. A few years ago, I managed to revive its voice by carefully opening one of the seams and replacing the tiny batteries inside. I will have to do this again just to be able to hear “The Voice” for a little bit longer. I was lucky enough to have met Harry a few brief times, and he was never in too much of a hurry to sign autographs or take photos with the fans. I’ll share a few favorite photos. Harry posed with my friend Jill and me (I’m on the left) at the Baseball 101 For Women event held in May 2007. 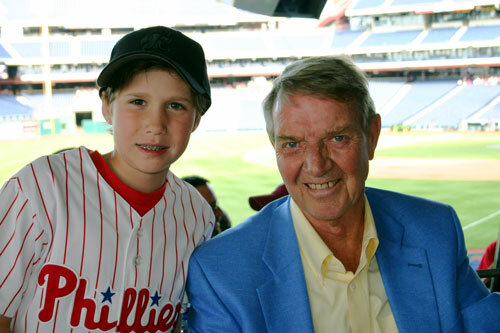 Also in 2007, Harry was kind enough to take this photo with my son at the annual Phillies Phestival. Lastly, here I am with Harry at the 2008 Baseball 101 For Women event. It will be strange this season not to hear Harry’s voice during Phillies games, though I’m sure I’ll adjust eventually. I imagine he and Whitey are together again, calling the games from heaven’s booth. Rest in peace, Harry, we will miss you! I’m a bit speechless right now. My husband just called to say he’d heard on the radio that long-time Phillies announcer Harry Kalas had died. “Are you serious?” is what I think I said. Unfortunately it is true. He had apparently collapsed in the team’s broadcast booth at National’s Park, where the Phillies are playing the Nationals in the Nats’ home opener. I’ll be back later after I’ve organized my thoughts. In the meantime, here’s one of my favorite bobbleheads, of Harry and Whitey. Harry Kalas and Richie Ashburn were, to me, the best pair of announcers a team could have. If there’s a baseball team in heaven, they’ve got a great team in the booth now.